You will be picked up by our chauffeured style driven vehicle and taken to Pearl Harbor where you are offered a cold drink of water or tropical juice before accompanied to the entrance of the Visitors Center. You will be met by our supervisor dressed in black with a gold tie to give you a brief orientation and provide your vouchers & tickets. Feel the comfort as we take you to the most visited Pearl Harbor historic sites. 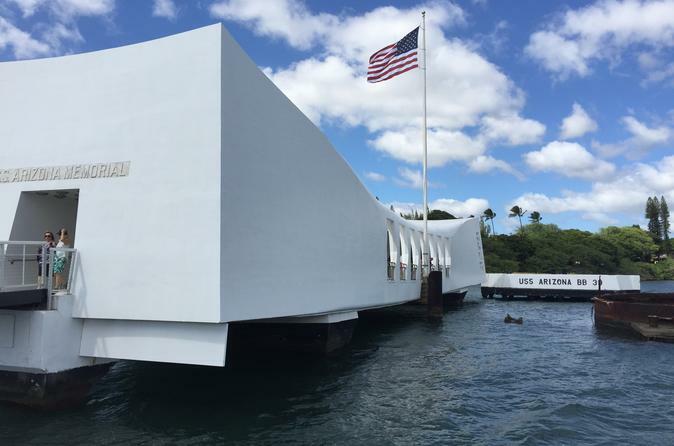 This self-directed Pearl Harbor tour/private transfer package includes USS Arizona Memorial tour and a complete city tour to some great places and structures in downtown Honolulu and East Oahu. Pickup by a chauffeured-style vehicle and drive to Pearl Harbor. Enjoy a cold drink (water or juice) before being taken to the Pearl Harbor Visitor's Center. Listen to brief orientation as vouchers and tickets are distributed by your host. Take a boat launch to the USS Arizona for your self-guided tour, audio guides available in six languages. Pay tribute to the heroes of Pearl Harbor at the Punchbowl Memorial Cemetery. Enjoy a Honolulu city tour following Pearl Harbor. Drive through Historic Downtown Honolulu and see the Statue of King Kamehameha and Iolani Palace. Visit the affluent neighborhood of Kahala. Pass through Waikiki for photo opportunities of the majestic Diamond Head. Continue on to the famous Halona Blowhole.